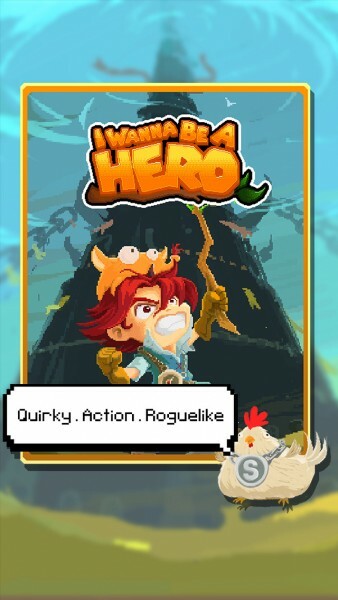 I Wanna Be A Hero ($2.99) by 4EVA Studios Pte. 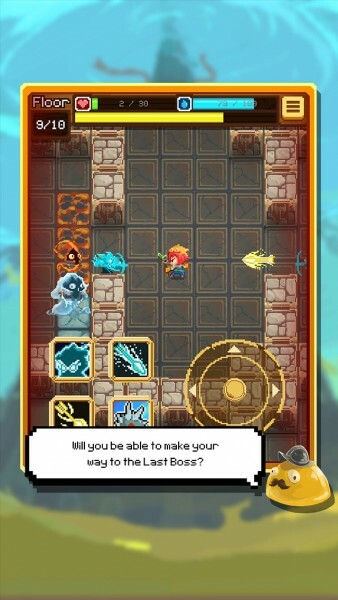 Ltd. is a rhythm-based dungeon crawler roguelike that will keep you busy for a long time. 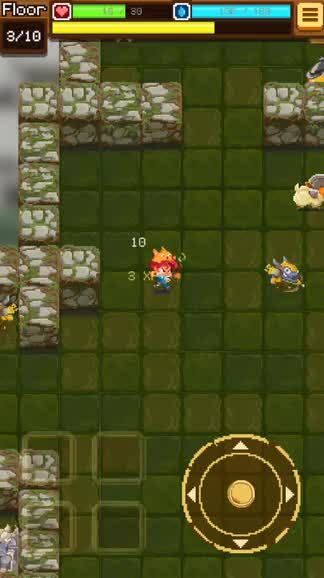 If you love grid-based roguelike games but are tired of the turn-based method, then I Wanna Be A Hero will be right up your alley. It is similar to the critically acclaimed Crypt of the NecroDancer that is available on Steam (PC, Mac, and Linux), PlayStation 4, and PlayStation Vita. Ever since I was introduced to roguelike games a few years ago, I became addicted to them, especially the ones that have the pixelated, retro look to them. I am not sure why, but I enjoy these games because it’s never the same thing twice, and while I constantly die and lose my progress, the test of doing better on the next go makes me keep coming back to them. 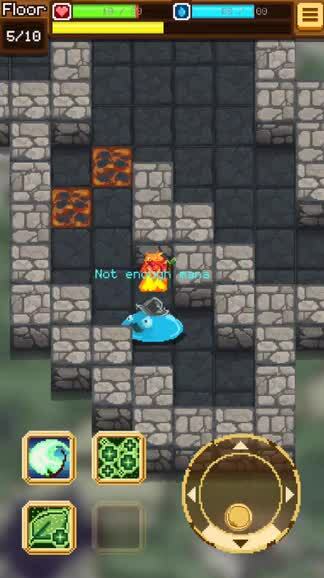 I’ve gone through several dozen roguelike games through the years, with most of them being on iOS (thanks to ports) as well as on my computer and other consoles. One game that has been on my list for a while, though, is Crypt of the NecroDancer, which I haven’t bought myself yet, but have seen plenty of videos in regards to the interesting gameplay and great music. While I would love having Crypt of the NecroDancer on my iPhone, I think I Wanna Be A Hero is enough at the moment to hold me over until that day comes. The visuals in I Wanna Be A Hero are a great homage to the 16-bit games of yesteryear. If you grew up with the classic systems like SNES and Sega Genesis, then you’ll feel right at home with I Wanna Be A Hero. Despite the pixelated aesthetic, the dungeon layouts are nicely textured and fairly detailed. The colors are also well done, as everything is bright, vibrant, and rich. All character sprites stand out nicely against the dungeon grids, and it’s easy to see everything that is happening from a single glance. Animations are smooth and fluid, which is rather important considering that all of the action in this roguelike occurs in real-time. Another great thing about I Wanna Be A Hero is the music. 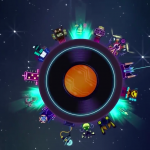 Since this is a rhythm-based roguelike, the tunes are just as important as the gameplay itself, and it excels in this department. The soundtrack and sound effects for I Wanna Be A Hero is done by IMBA Interactive, and it’s a fantastic mix of electronic chiptunes that remind me of the music in Crypt of the NecroDancer. You’ll want to make sure you have the volume up for this game, or immerse yourself even more with a good pair of headphones or earbuds. 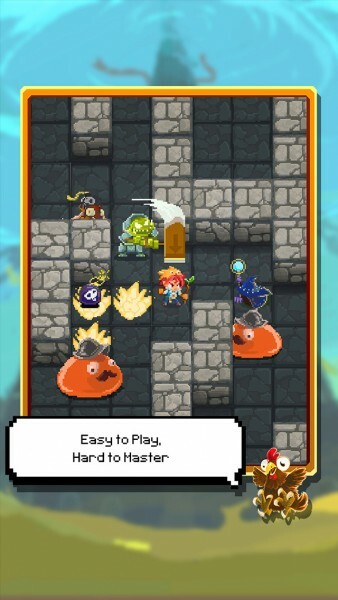 The beat of the music will help you in maneuvering your way through dangerous dungeons and dodging foes. Like other roguelikes, I Wanna Be A Hero is a grid-based dungeon crawler that will always be procedurally generated so no two runs will ever be the same thing. The main objective in the game is to help the protagonist go through a monster filled dungeon in order to prove himself worthy as a hero. This is done by making your way through floors, battling creatures and dodging their attacks, earning experience points to level up and learn new skills, and just see how far you can go without dying. When you do die, the game essentially resets and you have to start over from the beginning of the journey. Controls in I Wanna Be A Hero are pretty simple and straightforward. 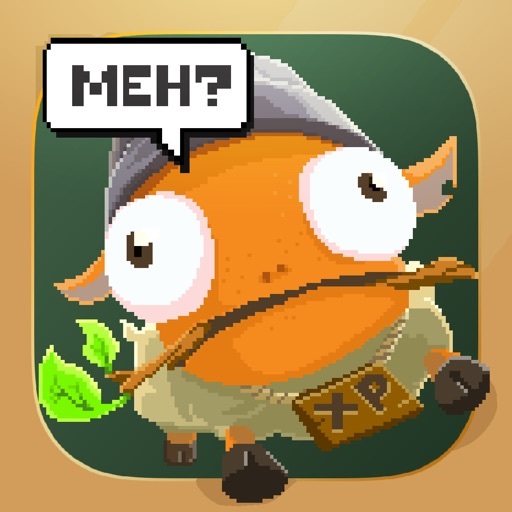 Unlike many of the other iOS roguelike games, this title does not use swipe controls that can get in the way of your vision when moving around in real-time. Instead, there is a virtual d-pad in the bottom right corner that you use to go left, right, up, or down on the screen. 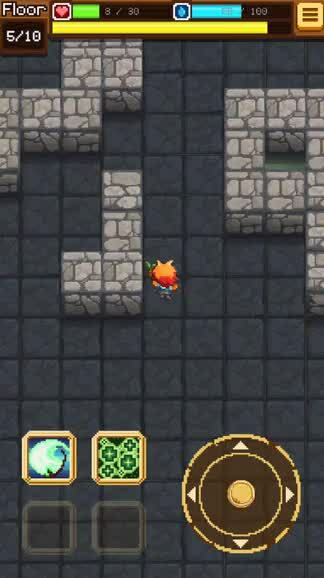 While you can tap the arrows one-at-a-time, you can also hold down on a side to continuously move in that direction. When a foe is adjacent to you, just move into their square to do a melee attack on them until they’re dead. As you accumulate experience points from fallen enemies, you’ll gain new abilities that you can use to aid you in battle. These are activated with a tap of the appropriate icon in the bottom left corner area of the screen. 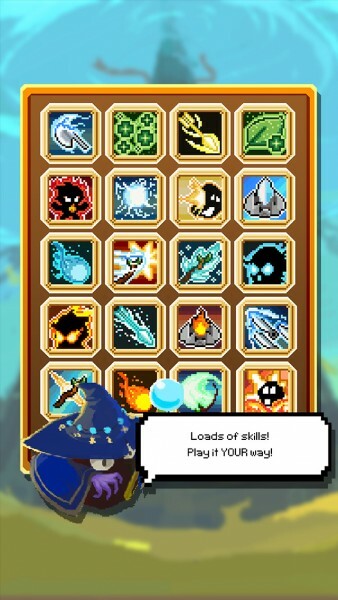 You can have up to four abilities at once, and there are over 30 to choose from (your choices are randomized each run). 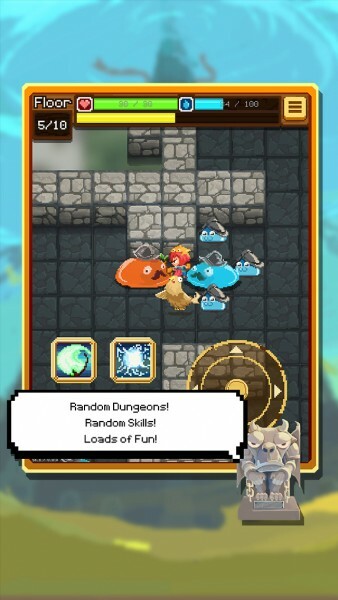 While things start out pretty easy at first in terms of enemy monsters, you’ll discover that the difficulty amps up as you get the deeper into the dungeon. There will be big fat monsters that break up into several smaller versions, ranged attackers, and even challenging boss battles that await you in I Wanna Be A Hero. The trick is to learn the behavior patterns of each enemy and go with the music to strategize and plan a way to avoid being hit while taking them out at the same time. I’ve only started playing I Wanna Be A Hero since the weekend, but so far I’m loving every moment of it. The visuals are a great homage to my childhood days, the chiptunes are quirky and upbeat, the controls are simple enough, and the randomized gameplay means a new challenge awaits on each run. The only thing I would like to see improvements on is having more options for controls, because while it works right now, it can feel a bit imprecise at times. Perhaps an optimized d-pad can be added in the future, or even the choice of swipe controls. And while the replay value is already high, I would have liked to see a bit more to the game, such as points and stats at the end of each go, as well as achievements. One can only hope that these are added at some point. Still, I recommend giving I Wanna Be A Hero a try if you’re a fan of rhythm-based games and love a good grid-based dungeon crawler roguelike. 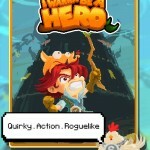 You can find I Wanna Be A Hero on the App Store as a universal download for your iPhone and iPad for just $2.99.